'Ib-Parad' OH ( C. G. Van Tubergen). AR. I. iberica X I. paradoxa . 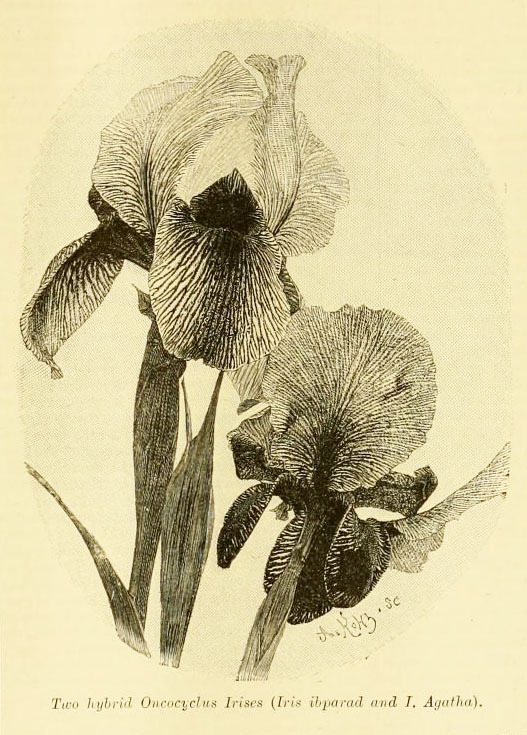 The beautiful Oncocyclus section of Irises has of late received special attention, and from time to time new species, imported at great cost from far-off countries, have been added to the somewhat short list of species belonging to this group. A few hybrid forms have of late appeared in the collections of those who, like myself, are ardent admirers of this, by far the most attractive section of rhizomatous Irids. The illustration shows two forms which I have raised, and which ilowered here for the first time last spring. The flower in the right-liand corner is a cross which I, following Professor Foster, have called ibparad, and which originated from crossing I. iberica with a specially beautiful variety of the quaint I. paradoxa. The seed was sown in 1880, remained dormant for two years, and the seedlings, after making a vigorous growth in the summer of last year, bore from five to seven spikes on each plant. In size the flowers are intermediate between those of tlie parents, but they surpass them both in colour and handsome form. Of I. Ib-parad, the standards are of a warm vinous lilac-purple, with numerous darker veins, the central portion of the lip being of a beautiful velvety black and marked with a reddish ^ shaped stripe, which shows its affinity to I. paradoxa. The remaining portion of the lip is grey, with stripes of a dark brown, not splashed, as in iberica, but distinctly striped. The reverse cross (I. paradoxa X iberica) gave flowers of a somewhat similar shape and colouring, but not nearly so beautiful as in the form here described. The other flower, that in the left-hand corner, is a cross which I have called Iris Agatha. In naming this Iris I plead guilty of not following Professor Foster in naming similar hybrid forms. But how can a readable name be obtained from an amalgamation of two such lengthy names as I. iberica van Houtteana and Iris Korolkowi venosa? Apart from the question of names, which I think is a very minor one, this Iris Agatha is certaiidy one of the most beautiful hybrid Irises with which I am acquainted. The stems attain a height of 2 feet, and it at once shows its parentage to the Korolkowi group by its producing two flowers in succession on each scape. The flowers are large, the standards of a very pale lilac colour, covered with a network of purple veins ; the lip is large, 2 inches broad, the body colour of a silvery-grey and the central portion of a dark purplish-maroon. with very conspicuous radiating veins of the same colour, the whole flower presenting a highly refined appearance. I can especially recommend the hybrid Oncocyclus Irises to those who have difficulties in growing this class, as the hybrid forms are far easier to grow and flower than the original species. C. G. VAN TUBERGEN, JUNR. Haarlem, Holland."